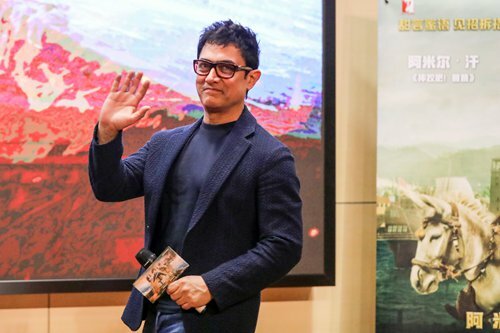 Aamir Khan, the iconic Indian movie star, attended a promotional event for his movie Thugs of Hindostan on Tuesday evening at Xidian University in Xi'an, Shaanxi Province, spending nearly two hours answering questions from his fans. Thugs of Hindostan is scheduled to hit Chinese mainland theaters on December 28. A household name in China, Khan has seen both critical and financial success in China in recent years. His sports film Dangal, which has a 9.1/10 on media review site Douban, earned 1.3 billion yuan ($188 million) to become the highest-earning Indian film in China. Thugs of Hindostan was a critical and financial failure after it debuted in India on November 8. The producers are most likely looking toward the Chinese market to bolster the film's low box-office returns. Talking to fans, the star expressed his desire to star in a Chinese movie, noting that he was fully confident that he could speak some lines in Chinese. Khan noted he hopes to work with Chinese directors Peter Chan and Feng Xiaogang. He emphasized that he found Feng's Youth particularly captivating. Talking about Chinese actors he would like to work with, Khan mentioned Deng Chao and Wang Baoqiang, two actors with large followings in China. He also noted that he stays in touch with Huang Bo, a Chinese actor, on WeChat and said that he misses the delicious "Century Eggs" he was given as a gift by Deng. At the event, fans presented the actor with a Chinese shadow puppet of the Monkey King, the famed character from the classic work Journey to the West, as a gift.